Canara Bank is scheduled to conduct online examination for the post of PO through Admission to Postgraduate Diploma in Banking and Finance Course (PGDBF) on 4th March 2018. A huge number of candidates who are looking for the jobs applied for the exam. 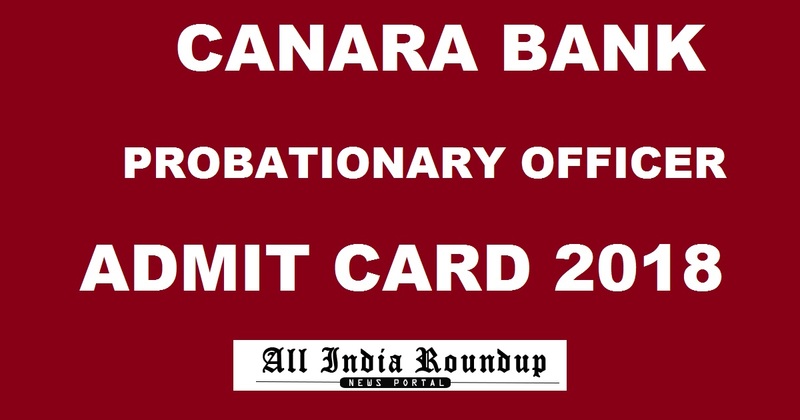 Candidates who had applied are searching for the Canara Bank PO Admit Card 2018 as it is the crucial document to carry for the exam and contains details regarding exam venue, roll number etc. Canara Bank released PO Admit Card 2018. Candidates can download admit card from the direct link provided below. Canara Bank is an Indian state-owned bank headquartered in Bangalore, in Karnataka. It was established at Mangalore in 1906, making it one of the oldest banks in the country. It releases notification whenever there are vacancies in various departments. This year it has released notification for the recruitment of Probationary Officer posts and the candidates who had applied can download call letter from the official website. Canara Bank has released notification for the recruitment of candidates as probationary officers. There are about 450 vacant positions for which the notification is released. A large number of eligible and interested candidates applied for the exam. Candidates who had applied can download admit card from the direct link provided below. Click on Canara Bank Call Letter. Enter your registration number & DOB in the provided fields. Stay tuned to this website. We will update Canara Bank PO Results 2018 here. Press CTRL+D to bookmark this page for easy navigation.